Selectmen go line-by-line to shrink expenses. Aquinnah is facing an estimated $450,000 Proposition 2½ override, and town officials are looking to cut budget costs wherever they can. Although Aquinnah’s budget has not yet been released to the public (due to the annual town meeting being scheduled later than other towns), town administrator Jeff Madison expects it to be approximately $5.4 million in operating costs. If the override stays at its current approximate level and passes at town election, Aquinnah’s tax rate will increase from $6.12 per $1,000, to around $7 per $1,000, adding permanently to the town’s levy limit. The finance committee met with various town officials Friday to discuss ways of shrinking budgetary commitments to limit the amount of the override. Assessor Sarah Saltonstall told the committee that the line item in the budget for the Up-Island Council on Aging services in West Tisbury may be a place to cut. She said the services are largely underutilized as it is, and wondered what the value of the services they provide are. She also mentioned that the distance Aquinnah residents have to drive to access the Up-Island Council on Aging is too far for most to make the trip. “I appreciate their services, and a lot of the programs they have are very good, but it is a long way from Aquinnah, very few people go there,” she said. Saltonstall also noted that the many programs the council hosts cost money, even when the town is allocating money for their services. “I’m not going to drive all the way to West Tisbury for a program and have to pay a fee when the town is already paying them all this money,” she said. Assessor Elise LeBovit brought up increases in Madison’s salary, and suggested looking into it. LeBovit suggested looking into a marketer just for the Aquinnah lighthouse, who would plan events and gain publicity for the light. Aquinnah usually pays the Martha’s Vineyard Museum $7,000 to garner attention for the lighthouse, LeBovit said. But she noted it might be more financially beneficial to hire someone specifically for marketing the classic Island landmark. LeBovit also said the town increased Madison’s salary after he agreed to write grants, but Aquinnah just hired a grant writer. “We should look into Jeffrey’s salary,” she reiterated. 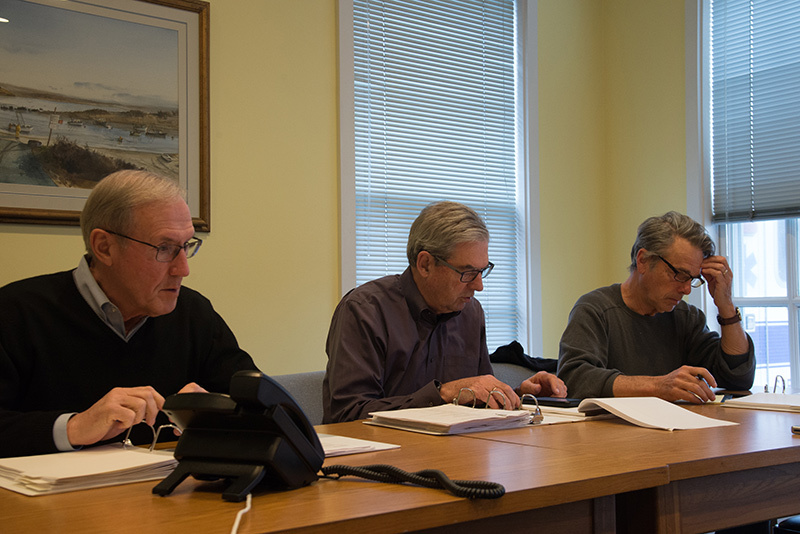 The Aquinnah selectmen also met with assessors earlier in the week after hearing from the Regional Resource Group, a Leominster firm that may be taking over the assessors’ position, should selectmen choose to approve the contract. Because the town is facing such a massive override, selectmen chairman Gary Haley said the town is looking at outsourcing the assessor position in order to cut costs. “This assessor position could save us a huge amount of money if it happens,” Haley said. Madison reminded the board that he is requesting that they issue a request for proposal (RFP) for the contract with Regional Resource Group, not that they make a final decision on going with the firm. The firm would cost the town $38,400 for fiscal year 2020, $39,500 for 2021, and $40,700 for 2022. There would also be a $3,800 annual hosting fee for a remote help desk where Aquinnah residents can speak directly with an assessor through an online medium. Assistant assessor Angela Cywinski told selectmen that it is the board of assessors’ purview to issue the RFP. She went on to say that she wishes the selectmen would communicate more openly with the assessors, and ask their opinions. If the town decides to use Regional Resource Group for their assessing services, Cywinski’s paid job as assistant assessor would be eliminated. Aquinnah’s fiscal difficulties result from the fact that about 20% of its budget pays for services to federal trust land that pays no taxes. As a result, the town inevitably will hit the legal tax ceiling, yet it refuses to seek the federal reimbursement promised in the settlement that would solve the problem. Meanwhile, the Tribe builds a casino in town which will brings the fiscal cliff closer, sooner, by increasing costs and reducing property values. Neither Selectmen nor FinCom will address Assessors’ concerns about town revenues, instead they want to silence the message by contracting out the messenger’s job. What steps will Selectmen take to protect their town? Why not seek federal reimbursement? Quitting the unfair council on aging, reducing Jeffrey’s salary and privatizing Angela’s job won’t come close to solving the problem. FinCom and Selectmen hurt their town by ignoring the tax ceiling and federal reimbursement as a solution. Maybe setting aside say 10% of the next fiscal years budget to feed into the slot machines at the new Aquinnah casino could pay off big for the town. Nor has anyone suggested raising the fees at the Circle comfort station to minimum $10, to give that good old fashioned Aquinnah welcome to the summer tourists. As well to balance the budget. Aquinnah selectman continue to show their management abilities. What an absolute mess. None of their suggestions will even marginally close the gap they are facing. It will only end one personal grudge they have an assessor. If the citizens of the town approve a large override , well, no problem– pay for it with increased taxes. If the people don’t want their taxes raised, then they should vote no on the override. There is no getting around the fact that Aquinnah is a fiscal train wreck. After a significant increase in property taxes last year, this article is suggesting another 14%+ increase of the tax rate is on the way. This is not sustainable and the suggestion above on how to cut costs are close to rounding error. The budget needs to be cut by a half a million dollars. The only conceivable way to get close to this number is focusing on the big ticket items. That’s the harsh reality. This won’t be easy or pleasant. I wonder if hiring a fiscal consultant would be worthwhile?